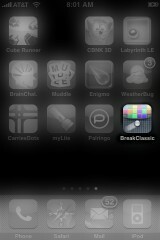 BreakClassic is similar to breakout with a few cool features. When you open the application, you will get a splash screen with the option New Game. When you select New Game, you will then be brought to the play screen. 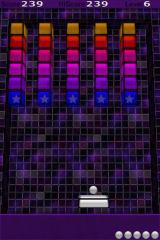 At the top of the screen is your Current Score, HiScore and the Level you are on. 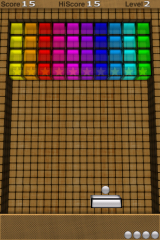 At the bottom of the screen is the number of balls you have left. 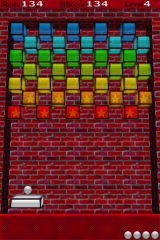 The object of the game is to break all the block by hitting them with the ball. To begin, touch the paddle. The second level is where thing start to get a little more fun. 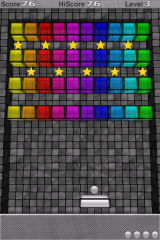 The blocks are colored and there are stars inside some of the block. 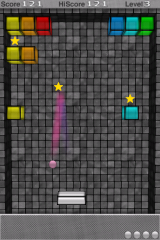 If you hit a block that has a star, the star will drop as well. You get extra points if you are able to catch the start on your paddle. 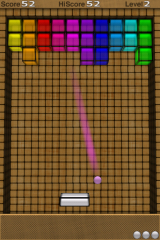 Another cool feature is that the ball and the smoke following the ball change color based on the last block it hit. 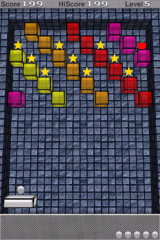 As the levels go on you will get more stars and also apples. 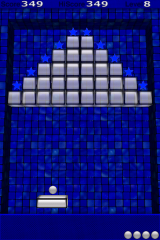 Once you have used all your available balls, you will automatically be brought back to the first level. There are no Settings for this application (it is free!) however, the sounds are effected by the iPhone’s main volume controls so, you can adjust the volume or mute it using the main controls. One cool feature is the ability to Resume a game once you have closed the application. When you go back into the app, there will be two options on the splash screen; Restore Game and New Game. 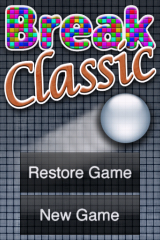 Restore Game will bring you back to the the last level you were on. It does not bring you back exactly to where you were in the game instead, it just brings you to the beginning of the level. There is one feature that I would like to see and that is the ability to pause the game! The only way you are able to pause the game now is to let the ball go past your paddle and then not touch the paddle to start the next ball. 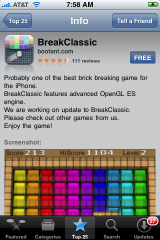 Click here to download BreakClassic via the App Store. 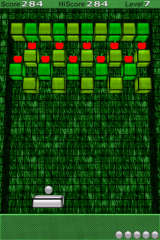 It’s similar to breakout….not pong. But whatever you say, it still looks kind of neat considering I won’t pay for applications. 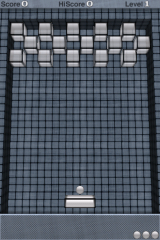 Yes, I meant breakout…not pong! this app is actually really good! From the amount of screen shots you have there, I’d guess that you love this game. It is a pretty cool app i just played it for a few minutes and got to like level 11 and stopped cause my battery is low but i like it. I only got to 8…that is too bad that they are only 15 levels. Maybe we will see an update that adds more. There are several apps like these, which are decent, fun to try out, but you may never touch it again after you play with it for an hour or so. they just put out an update i think yesterday and there is still atleast 15 levels but some are different than b4 and there are added features like the ability to juggle more than one ball at the same time. there are more and different sounds… now instead of hearing a doorbell evertime you get a star or apple its something different and you also get a “charge” type tone when you beat a level.